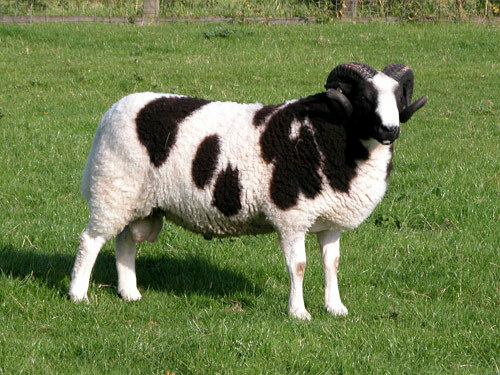 Jacob Sheep were traditionally a parkland breed but it is now much more widespread and is found in every part of the British Isles and in several countries around the world. It is an alert and attractive sheep being upstanding and deep bodied. Its white fleece has well defined black patches, the head and neck being mostly black with a white blaze. Both sexes are horned with either two or four horns. Jacob ewes are hardy and excellent mothers who milk well, frequently having twins or triplets. The finished lamb is tender and lean with an excellent flavor with a good meat to bone ratio, which is now sought after by butchers nationwide. The fleece has a great appeal to spinners and weavers. The AJSR is a privately-held registry, guided by devoted Jacob breeders who value their sheep and the preservation of the breed over bureaucracy and politics. All animals registered by the AJSR are the result of a planned program on the part of the owners/breeders of the individual animals. The herdbook of the AJSR will remain permanently open to any individual sheep which has adequately demonstrated its ability to reproduce in kind, in accordance with the breed-testing program. The AJSR does not offer "memberships" nor does it charge dues.